If you live in Chicago, you’ve probably reached your threshold when it comes to hearing about the upcoming mayoral and city official elections. 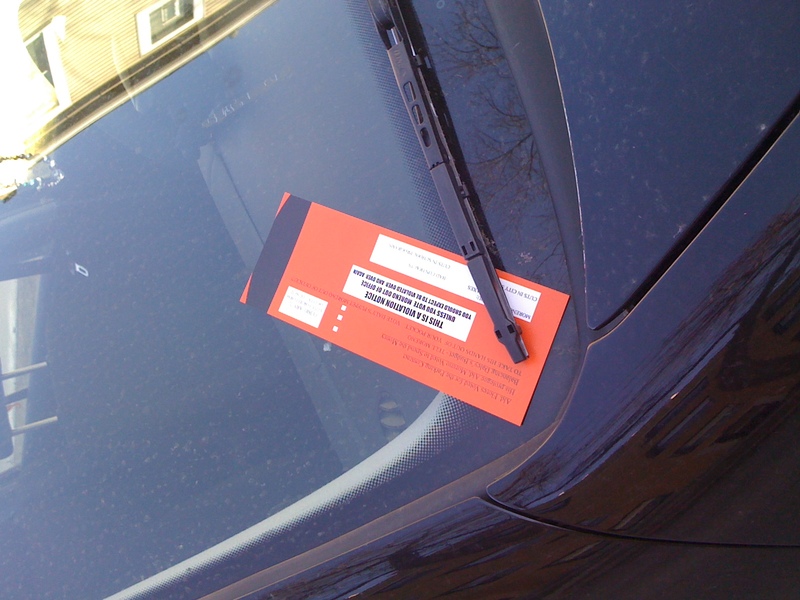 This isn’t our car, but one of these orange slips of papers was on our windshield this morning. Our wounds still fresh from a parking ticket Joe got last weekend while ordering chicken wings, we burst into a fury upon first glance of our windshield. 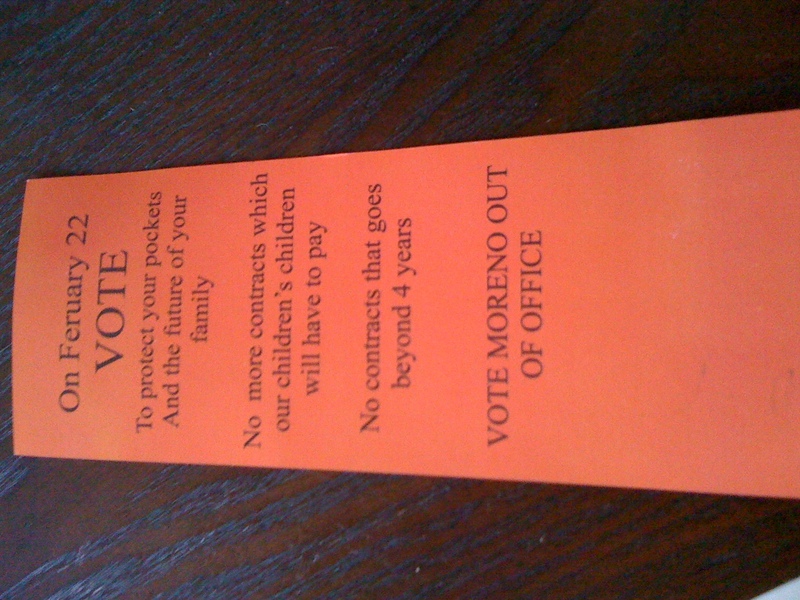 Upon further inspection, we realized this was actually a flyer about voting Alderman Moreno out of office next Tuesday. It just happened to be designed too similarly to a parking ticket. Insult to injury: February is spelled incorrectly. Well, I suppose this advertisement worked—it got our attention, albeit in a negative way. It seems karma is coming back to me for writing all of those “official” looking direct mail letters back in the day. Owning a car in the city is a blessing and a curse. On one hand, it’s easy to run errands, haul things from the grocery store, take road trips or venture to Ikea. On the other, you have to deal with tickets, city stickers, fear of towing and the annoyance of continual stop-and-go traffic. Yep, a $50 violation for street cleaning. Street cleaning in November, you may ask? Apparently this is the last one of the year. Here’s what makes me most upset about the parking ticket situation: The city doesn’t hide the fact that they make money off your parking misery. Notice the return address goes to the Department of Revenue? The ticket enforcers (meter maids?) wear yellow vests that read the same thing. Well, all I have to say is I hope the holiday decorations on Michigan Avenue are extra sparkly and fabulous this year. You’re welcome. Happy holidays. Some people love Twitter. Some people hate Twitter. 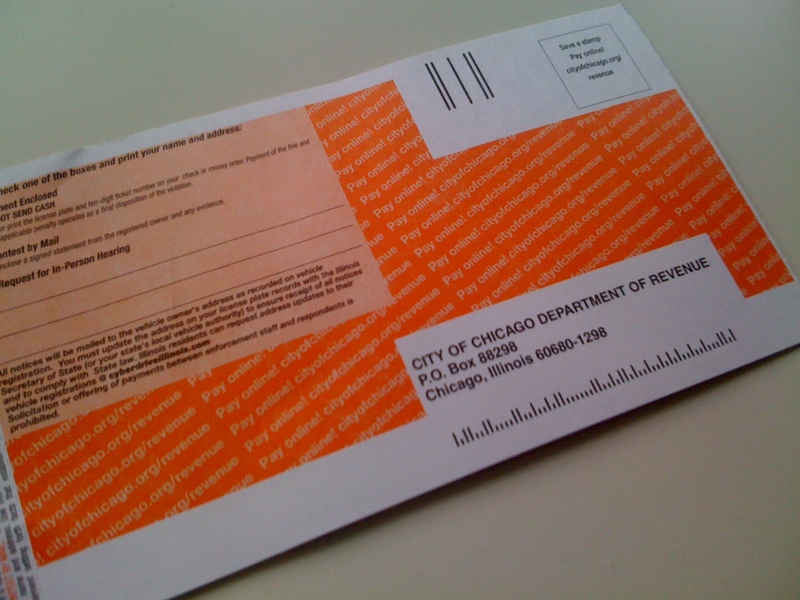 Today I decided I love Twitter, especially for the Chicagoist‘s tweet reminding me that today is the very last day to get a new city sticker without paying the $40 late fee. Or the $120 ticket for not having one. Yep, a $120 ticket. That happened to me once. And that $120 missing from my bank account is now sitting in a beautiful flower pot on Michigan Ave. I hope the tourists are enjoying it. The Foxy Focus has accumulated a few stickers on her windshield since living in Chicago. She displays them with pride. And in places where there were once stickers is gummy residue that linger despite extreme scrubbing efforts and Goo Gone. I guess a windshield never forgets. The new city sticker will go under its orange friends. Yes, I really went outside at midnight to try to take a picture of the Focus in the dark with my iPhone. The more I think about the stickers I’ve attempted to peel off Foxy, the more it makes me sad that I did it. Sure, the parking sticker collection makes Foxy’s windshield look cluttered, but peeling them off is almost like stripping her of earned badges of honor. Each sticker represents strength in overcoming in street parking adversities and clever skills in diverting parking meter attendants. And certainly, these feats warrant recognition. Three years of honored service evading tickets and facing dents on the bumper. Wait, is that The Club on the windshield? Not so tough after all. Holly's "car" for the week. Quite an impressive display of perseverance and years of service on the city's curbs. So in other words, I’ll be using the “medal of honor” excuse if anyone asks why my car has so many stickers on its windshield. Unless anyone will take five crispy one dollar bills to remove those babies for me. Not everyone at once, ok.